Great Find in Key West This was our third time staying at Center Court in the third different unit. All great. Privacy, pool access, 1 block off Duval without the noise. Housekeeping does a great job, we will come back again and again! Beautiful home Everything was excellent! Great location, beautifully decorated, nice amenities. Looking forward to renting again. Delightful house for our trip to Key West1011 Simonton Street, Key West, FL, 33040, United States 5 Stars all the way We traveled with our adult children, ages 21 and 24. We wanted to be able to park our car and walk everywhere. The house was beautifully appointed and a pleasure to be in. We enjoyed the pool and loved the uplights that turned on at dusk along the deck perimeter. We would not hesitate to book this house again on a future visit and have already recommended the house to friends. Clean and nicely decorated! Great place for 4 couples. We took 5, as there was a pullout in the family room but it was VERY uncomfortable, even for one night. Great location, super close to Duval. House basically is all bedrooms, with small living area and small (but very functional) kitchen. Covered outdoor area was the BEST! We didn't have the nicest weather, so for 10 of us, it was great to spread out at the table for games, meals, and just visiting. Pool was very nice as well. Only drawback is there were 'workers' onsite ALL DAY LONG. There was no privacy, as someone was always there trimming a tree, doing laundry, moving about doing some type of maintenance on the property. Key West Getaway Clean, comfortable, and spacious -- this townhome was a superb choice for our recent Key West getaway. 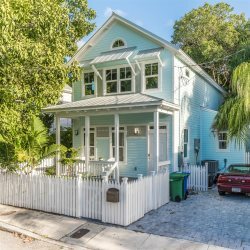 In additiion, the central location (just off Truman on Windsor), placed all the best of Key West within an easy walk or bike ride. Most importantly, the staff were genuinely friendly and very supportive. We were quite happy with our choice...you will be, too! Perfect spot for a family of 4 Wonderful property, wonderful location, just a great time. Very nice central AC - which we didn't think we would have to use in December - but it was 85 degrees and humid - so we really appreciated it. Just around the corner is a great market (Fausto's) and a killer Cuban Coffee spot - Sandy's Caf - you are literally 50 yards away from both of these places - so make sure you stop in. Place is spotless - and well appointed. We were there for the Patriots - Miami football game (week 17) - and had friends over to watch. Grilled Shrimp, mixed up drinks, hit the hot tub during 1/2 time - and watched the Patriots thrash the Dolphins - what a great time! Look forward to staying here again. Very nice house, well decorated and well-appointed. Staff was very helpful and accommodating. A definite recommendation. Honeymoon Getaway I liked very much the room and how clean it was. It was ready before the check-in scheduled time which made my husband and I very happy. The location is perfect, very close from Duval Street and the amenities were great. I would recommend this place to a friend. We will definitely come back in the future. Excellent House for relaxation! Great place to stay to relax both indoors and outdoors and be close to all the fun of Key West. The house has an awesome outdoor area with a pool and hot tub. Even has a covered area with a TV. Very relaxing outdoor space in a quiet part of town but close to Duvall. Lots of restaurants and shops footsteps away. The house is well furnished, clean and comfortable to have a family/friends of 6 adults stay comfortably. AMAZING AMAZING AMAZING We couldn't have chosen a better place to get together in Key West. The townhouse was very private. You have your own private pool and don't even see any other neighbors. It's very well designed and is impeccably clean. Will definitely be our number one choice for our next Key West vacation. If you're considering this property for your holiday, stop the search and book it! You will NOT be disappointed. Loved our stay at the Mango Cottage My now-husband and I rented the Mango Cottage when we came to Key West for our wedding. We had a fabulous stay. The place was large enough to work as a rendezvous point for guests staying all over the island, but it was also the perfect place to hole up and unwind for a few days after saying our "I dos". The property was clean and well taken care of, and the furnishings were beach without being too kitschy. We loved the hot tub and outdoor shower. We would definitely recommend staying here and hope to return again soon! Great Trip! The little pool made the trip perfect. The floor plan worked well for our needs. The company graciously kept our luggage when we arrived before the house was ready and again before we left. We would definitely return and recommend to a friend.